Frigiliana is just 7 kilometres north and inland from the coast at Nerja to which it is linked by several daily buses. It is definitely worth visiting this typical Andalucian mountain village during your stay in Nerja - allow a couple of hours for your visit to give you time to explore the narrow streets and stop for a drink at the viewpoint at the top. Situated in the foothills of the Sierra de Enmedio, a southern extension of the Almijara mountain range, Frigiliana is an extremely pretty village which has received several awards for conservation and beauty. It enjoys spectacular countryside as well as wonderful sea views and provides an alternative to staying in Nerja itself for those who wish to experience more of rural Spain whilst still being only a short drive from the beach and the shops and amenities of Nerja. 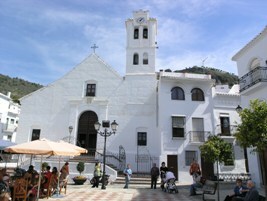 Frigiliana consists of two adjoining centres. One of Moorish & Medieval origin and the other constructed recently whilst imitating the architectural style of the old village. Between the two districts there are two interesting buildings, the former Granary built in 1767 and a 16th century Renaissance Palace which is now a molasses factory. Within the old sector, the narrow, winding streets are full of interesting shops and bars, and twelve mosaics by the artist Pilar Garcia Millan depict the village's history. At the high point of the town there are remains of a Moorish castle. The parish church of San Antonio is of 16th century construction and houses three excellent 17th century paintings. Settlement of the area originated in prehistoric times and archaeological sites date back to 3000-1500 BC. Phoenician and Roman remains have also been discovered. Acebuchal is an exceptionally beautiful hamlet situated right in the heart of the Sierras of Tejeda, Almijara and Alhama Natural Park. It sits almost on the border between Frigiliana and Competa. There are various names associated with the village of El Acebuchal – "the Lost Village" and "the Ghost Village – el Pueblo Fantasma," are the two that seem to be most commonly used. As with so many villages in the area, Frigiliana and Acebuchal suffered terribly during the Spanish Civil War. Frigiliana was declared ‘Red,’ (Republican) in July of 1936. The Fascists quickly retook the village in February of 1937 and took their revenge on anyone suspected of being communist. After the Civil War ended, Franco's attention turned to the resistance movements and a long period of fighting between the facists and the guerillas began, lasting until 1952, with Frigiliana and El Acebuchal right in the front line. In the summer of 1948 the authorities ordered the residents of Acebuchal (some 200 people) to leave their homes (the village had long been suspected of providing refuge and food to the guerrillas) and so the village is left empty and abandoned. The ‘ghost’ village of Acebuchal remained abandoned until 1998 when one man – Antonio “El Zumbo” fulfilled a lifelong dream and returned to Acebuchal and began to rebuild the village bit-by-bit. The results are nothing short of spectacular, bearing in mind that everything was done by hand and there wasn’t even electricity or water until 2003. Antonio’s family now run a successful restaurant and rural hotel in the village. The food is fantastic, most of the produce is grown locally and organically. More information can be found on the restaurant's website. This is the only bar/restaurant in the village so it is wise to call ahead to check opening times if you are planning a visit! El Acebuchal can be reached via a 2 hour walk from Frigiliana, or by car (with the last part on an unmade track, passable with care).